Have I mentioned my love for cherries? I think that they are probably my favorite fruit of all time. The deep, rich red color, whimsical stem, and juicy goodness make it number one on my list. Unfortunately the only time of year I can afford these ruby red jewels is in the summer. So I make the most of it while I can and eat them by the bagful, bake with them, and make lots of beverages with them. 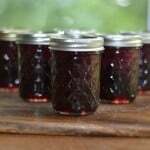 This year I finally decided to make them into jam that I can enjoy year round. Before you attempt to make this jam make sure you have several hours set aside. It’s not that making the jam takes a long time, it’s the stemming and seeding of the cherries that took forever. 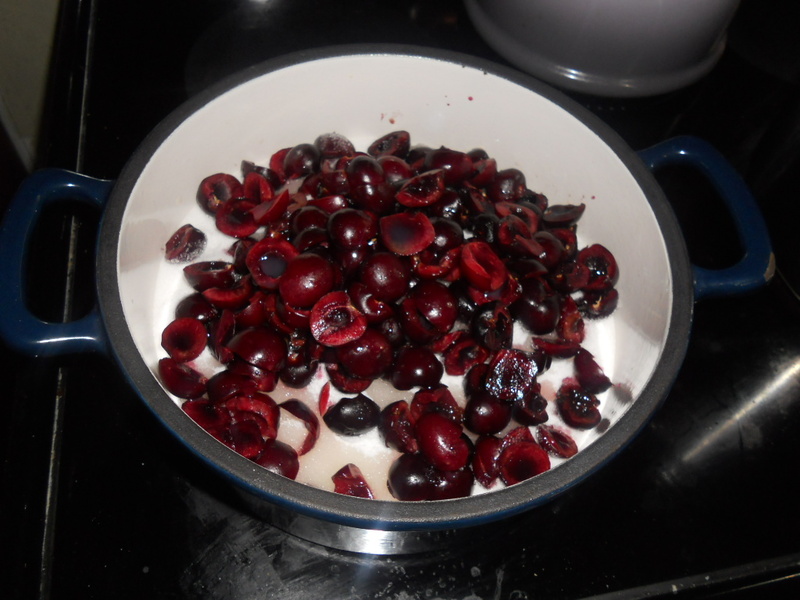 I’d say it took about an hour of my time and seriously stained hands to get the pits out of all of the cherries. 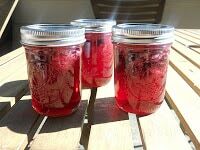 I was skeptical as to how the jam would form because the amount of liquid in the jam in minimal. 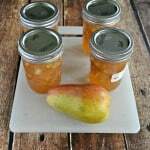 I had difficulty getting the sugar to dissolve before adding in the liquid pectin and so I ended up adding in one pouch of liquid pectin before it finally dissolved. I then added in the second pouch and followed the rest of the directions. 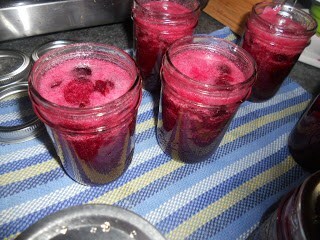 The deep red color of the jam is gorgeous and the taste is mostly sweet with just a hint of tartness. I can’t wait to be eating it in the middle of winter! 1. 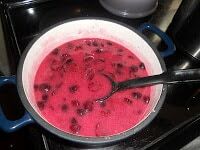 Combine the cherries, sugar, and lemon juice is a large saucepan. Stir until sugar begins to dissolve. 2. Add in one pouch of liquid pectin and bring to a boil. All of the sugar should be dissolved by this point. 3. 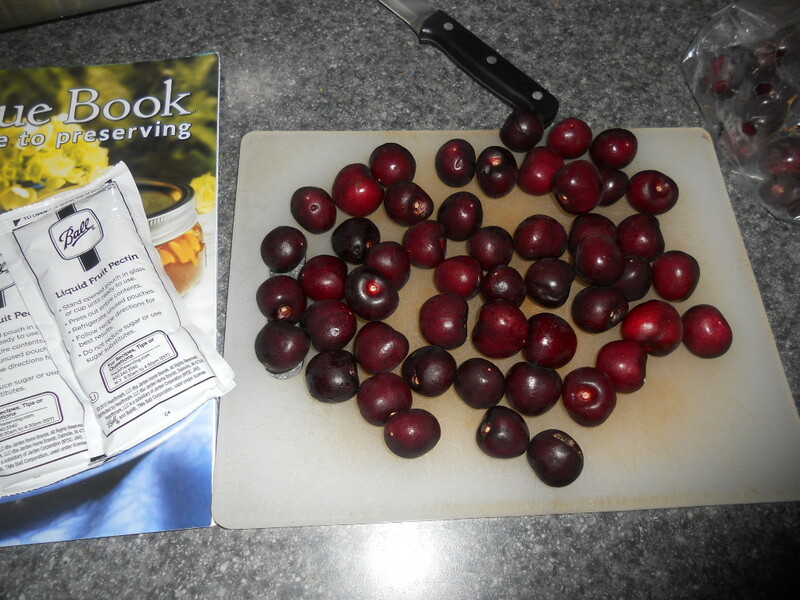 Stir in the remaining pouch of liquid pectin and bring to a rolling boil. Boil hard for 1 minute, stirring constantly. 4. Remove from heat and skim off the foam. 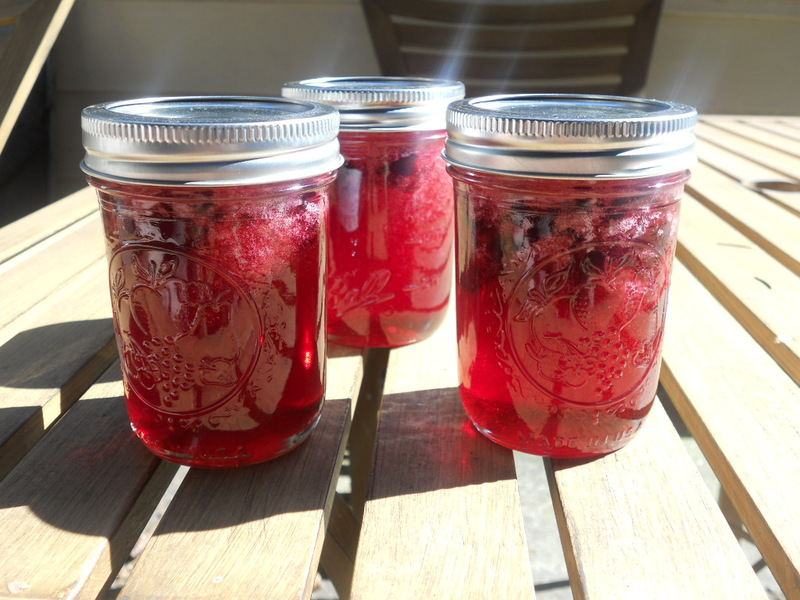 Ladle the jam into hot jars, leaving 1/4 inch of headspace. 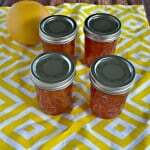 Remove any air bubbles from the jars and readjust the headspace. 5. Put on the 2 piece lid and screw to finger tip tight. Heat in a boiling water canner for 10 minutes with the lid on. Remove from heat and let sit for 5 minutes. Remove from the water and let cool for 12 hours then check to make sure the lids have sealed. Store for up to 1 year. **Makes 7 half pints of jam. What a great Cherry Jam, just perfect for Christmas! Thank you so much for sharing with Full Plate Thursday and a very Merry Christmas to you and your family. 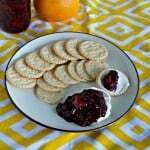 I have never had cherry jam, but it sounds and looks delicious! Thank you for sharing on Tasty Thursday.